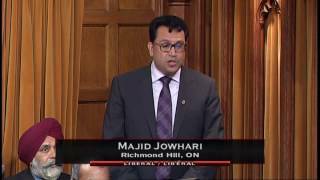 Mental health is an important issue to my constituents in Richmond Hill and to me. 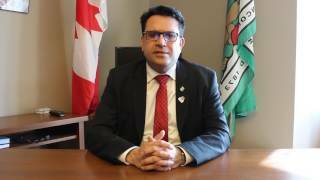 Watch this video to learn more about the my role in chairing the parliamentary mental health caucus, and my private member's bill, Bill C-375. Added July 25, 2018 from MP Jowhari Office. 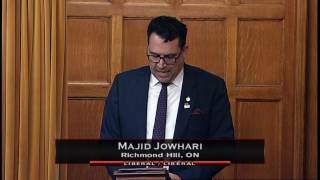 On Thursday I had the honour of rising in the House of Commons to speak about 360 Kids, a great Richmond Hill organization that works to give at-risk youth the support they need to reach a state of safety and stability. The resident's of Richmond Hill understand the importance of providing help to those who need it, and ending the stigma around mental health. I am inspired by their efforts to support this issue, and will do my part as Chair of the Parliamentary Mental Health Caucus to advance their concerns on the Parliamentary level. While the official opposition is unsure of their position, Canada's Liberal government stands to support net neutrality. Listen to Min. 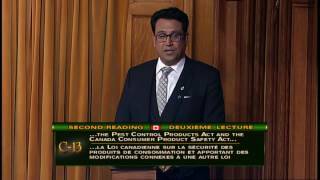 Bains as he reiterates the government’s position in response to MP Jowhari's question during the QP on December 12, 2017. 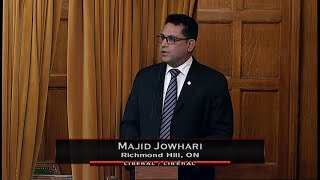 Private Member’s Bill C-375 introduced by Majid Jowhari, Member of Parliament for Richmond Hill, will amend paragraph 721(3)(a) of the criminal code so that, unless specified, when a pre-sentencing report is required by a court, in addition to such information as age, maturity, character, behavior, attitude, information outlining any mental health disorders as well as any mental health care programs available for the accused be provided as part of their pre-sentencing report. Currently, courts are not mandated to consider the mental health history of individuals in presentencing proceedings. This significantly increases the likelihood that such vital information will not be taken into account during presentencing and that individuals with histories of mental health issues may not be afforded appropriate care, compassion and treatment throughout the process of their rehabilitation. On Tuesday November 23 the Hon. 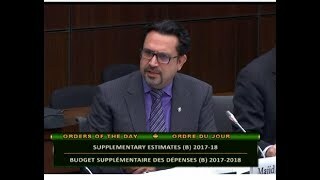 Navdeep Bains, Minister of Innovation, Science and Economic Development, appeared before the Standing Committee on Innovation, Science and Technology. 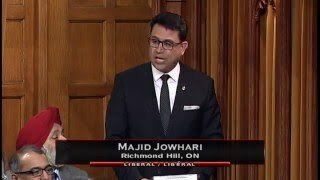 During the session Majid Jowhari, Member of Parliament for Richmond Hill, asked the minister a question on government’s Strategic Innovation Fund. 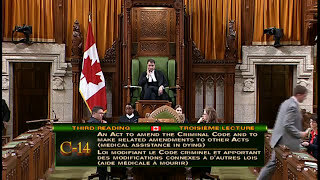 Bill C375: An Act to Amend Section 721 – 3(a) of the Criminal Code will mandate that, unless stated otherwise, when a pre-sentencing report is required by a court; in addition to such information as age, maturity, character, behaviour, attitude and willingness to make amends, information outlining any mental health disorders as well as any mental health care programs available for the accused be provided as part of their pre-sentencing report. Such information is vital for courts to have in order to ensure that those Canadians with histories of mental illness are afforded care and compassion, and that they will receive appropriate treatment throughout the process of their rehabilitation. 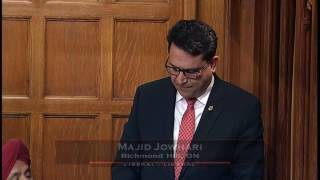 Majid Jowhari, Member of Parliament for Richmond Hill gave a statement in the house to recognize the Mental Health Awareness Week. "I rise today to acknowledge the beginning of Mental Illness Awareness Week, a national campaign coordinated by the Canadian Alliance on Mental Illness and Mental Health. As founder of the Liberal mental health caucus, this is an issue very important to me but even more important to one in five Canadians who will experience a mental illness this year. Visiting the Hill today are five individuals brave enough to share their own experiences with illness and recovery. Over the summer, I had the honour of recognizing another face of mental health. In my riding of Richmond Hill, Constables Ivanov and Latour from York Regional Police were the recipients of the special Canada 150 pin for going above and beyond the call of duty to save the life of a young woman suffering with mental illness. At YRP, “Deed...Indeed...Speaks”. On this day and every day let us reflect on what we can do in our offices and everyday lives to achieve a Canada where mental health issues receive timely, respectful care and support in parity with physical health conditions." Majid Jowhari, Member of Parliament for Richmond Hill, on behalf of the Honourable Patty Hajdu, Minister of Employment, Workforce Development and Labour, announces a new project that will give youth in Richmond Hill and across York Region job skills training and hands-on work experience. Up to 288 youth - 144 of whom are female- will participate in the Base 4 Success program, which will be delivered by 360 Degrees Kids. This project will allow youth to participate in 2 engaging weeks of training and receiving life skills such as budgeting, financial planning as well as job preparation skills such as resume writing, job interview skills and legal rights. They will then spend 10 weeks working in the retail, manufacturing, and service industries. The Government of Canada will provide approximately $2,146,718.00 in funding for this project through the Skills Link program of the Government’s Youth Employment Strategy. Skills Link supports projects that help young people who face more barriers to employment than others develop basic employability skills and gain valuable job experience, which, in turn, assists them in making a successful transition into the workforce or to return to school. These youth could include those who have not completed high school, single parents, Indigenous youth, young persons with disabilities, youth living in rural or remote areas or newcomers. 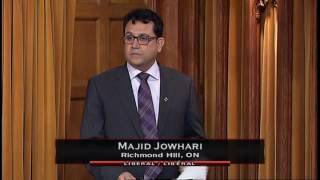 On June 8th, 2017, I rose in the House of Commons to condemn the vicious, ISIS-claimed attacks in Tehran: Mr. Speaker, Canada strongly condemns the recent terrorist attacks in Tehran, including those committed at the Iranian Parliament. We grieve the deaths and the injuries sustained by many civilians and deplore the targeting of innocent Iranians. Our thoughts and sympathies at this time are with the people of Iran. The timing of these attacks, carried out during the Holy Month of Ramadan, is an offence to the spirit of this sacred period. 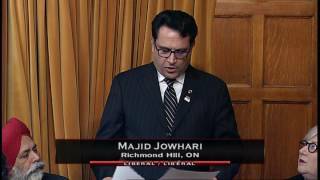 Mr. Speaker, I join Iranian-Canadians in my riding of Richmond Hill and with all Canadians in condemning this attack. Canada remains unwavering in the global fight against terrorism and the hatred on which it is based. 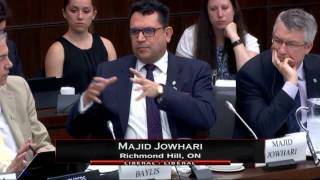 On May 18th, 2017, as part of the Standing Committee on Industry, Science, and Technology, I had the opportunity to ask the Minister of Innovation, Science, and Economic Development on the Government's innovation strategy. 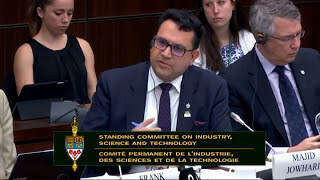 As part of the Standing Committee on Industry, Science, and Technology, I had the opportunity to ask The Hon. Bardish Chagger, Minister of Small Business and Tourism, on the positive impact Bill C-6 - Pre-clearance Act would have on Tourism in Canada. 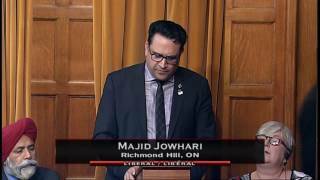 On May 9th, 2017, I had the great pleasure of standing in the House to speak on mental health. Here is what I said. 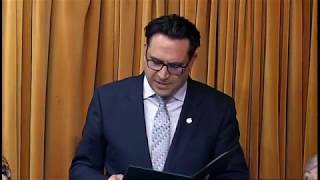 Full text: Mr. Speaker, Canadians from all walks of life recently participated in activities in support of Mental Health Week. As Chair of the Liberal Mental Health Caucus, I understand that one in five Canadians cope with some form of mental illness. Among them are the elderly, indigenous people, youth, individuals in correctional institutions, and our veterans. Addressing Mental Illness requires more than a week. It needs a full-time commitment from all levels of government. That’s why the federal government is working hard to make a difference. Budget 2017 allocates $5 billion to support mental health initiatives throughout Canada. 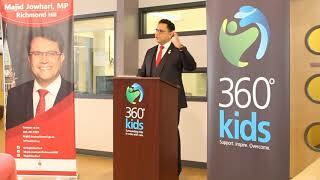 With a focus on youth, the funding will also help 500,000 young Canadians. I urge all Members in this House to continue working in their communities to ensure that Canadians needing Mental Health support receive it and can live productive and healthy lives. Thank you, Mr. Speaker. Wishing everyone celebrating in Richmond Hill a blessed and joyful Easter! On April 4th, 2017, the Hon. 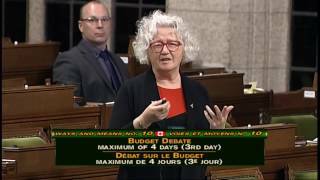 Member for Edmonton Strathcona asked me a question on Budget 2017. Here is my response. on April 4th, 2017, the Hon. Member for South Surrey - White Rock asked me a question on Budget 2017. Here is my response. On April 4th, 2017, the Hon. Member for South Surrey-White Rock asked me a question on Budget 2017. Here is my response. 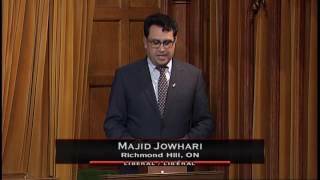 I was pleased to stand in the House on Tuesday, April 4th to discuss budget 2017 and its potential impact on my riding of Richmond Hill. 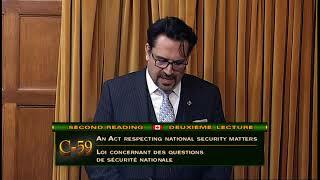 On March 24th, 2017, I was pleased to stand up in the House in support of Bill C-22, An Act to establish the National Security and Intelligence Committee of Parliamentarians and to make consequential amendments to certain Acts, in its 3rd reading. 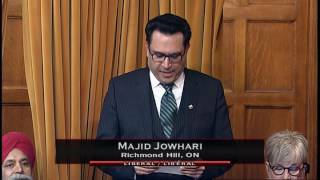 Text: Mr. Speaker, I am honoured to welcome Nowruz, the Persian New Year and arrival of spring. Recognized by the Parliament of Canada, Nowruz is a 3,000-year-old tradition celebrated by Iranian, Afghani, Azeri, Turkish, and other cultures rooted in central and western Asia. This festival embodies a wealth of ancient traditions and is a time when families and friends join together at the Haft-Seen table to celebrate new beginnings, exchange gifts, enjoy traditional delicacies, and signify hope for the year ahead. It is an opportunity to renew our collective commitment to harmony, acceptance, and understanding. 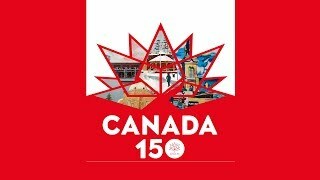 This year, Nowruz takes on special meaning as we also celebrate Canada's 150th birthday. 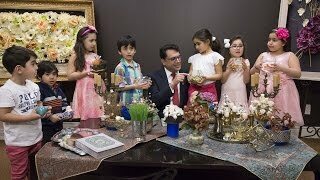 To all Canadians celebrating Nowruz: Har Ruz etan Nowrouz, Nowruz etan Pyrouz. 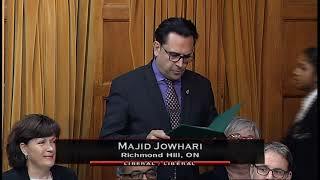 Member of Parliament, Majid Jowhari, extending his well wishes for the first day of spring and Nowruz 1396. In an effort to encourage political engagement, every month, Majid Jowhari, Member of Parliament for Richmond Hill, gathers with community members at a local cafe for a casual conversation on local issues. 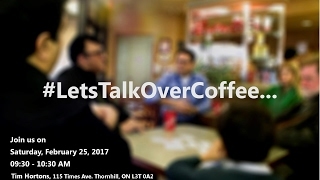 To join the next gathering follow the hashtag "#LetsTalkOverCoffee" on social media or contact 905.707.9701. It gave me great pride to stand up in the House to recognize the hard work of guidance counsellors all over Canada, and within schools in my very own riding of #RichmondHill. 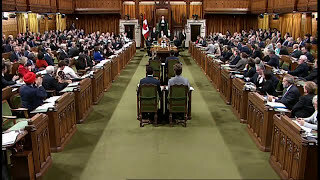 Full text of my speech: Mr. Speaker, on the occasion of Canadian School Counselling Week, I acknowledge and express my gratitude to an important group of dedicated people who work tirelessly with children, youth, and their families. Approximately one in seven Canadian children and youth suffers from some form of mental disorder that diminishes his or her opportunities for educational success. Fortunately, there are professional people who interact every day with our youth and work to improve scholastic performance and the overall mental health of our youth. I urge members of this House to join me in celebrating Canadian School Counselling Week and to recognize the work of school counsellors at learning institutions all across Canada, including schools in my riding of Richmond Hill, namely, Alexander Mackenzie High School, Bayview Secondary School, Langstaff Secondary School, and Jean Vanier Catholic High School. Our children and youth owe these counsellors our heartfelt appreciation. Full text of speech below: "Mr. Speaker, November 25 was the International Day for the Elimination of Violence against Women. To raise awareness on this issue, our Minister of Status of Women initiated the 16 days of activism against gender-based violence campaign, 2016. Through this initiative, the minister is inviting Canadians to think about the link between casual sexism and gender-based violence. To partake in the conversation, I must recognize Yellow Brick House, a not-for-profit charitable organization in Richmond Hill, which has been working with abused women and children in York Region for over 38 years. Last year alone, it assisted more than 5,500 women and children suffering from violence and abuse. The hashtag for this 16-day period is #actionsmatter. Well, Mr. Speaker, I attest today in this House that the actions of Yellow Brick House matter for changing lives in my riding of Richmond Hill." On Saturday November 26, 200 members of our Richmond Hill community gathered in memory of Gianluca Cellucci, the son of Ioanna and Carmelo, and brother of Francesca, who we tragically lost 9 months ago. The event was organized by 9 of Gianluca’s closest friends and included the unveiling of a stone plaque and recently planted tree in South Richvale Greenway, just to the west of the elementary school he attended. Mr. Speaker, today I wear a pin on my lapel that is emblazoned with Gianluca's signature as a reminder of the noble, determined and compassionate young man he was. Gianluca, was a political science graduate, who was passionate about social justice issues and aspired to join local law enforcement. Finally, I would like to acknowledge the hard work and wonderful tributes by Jacob Bruno, Robert Carmmalleri, Matthew Milone, Paolo Bolzon and Domenico Coccia. 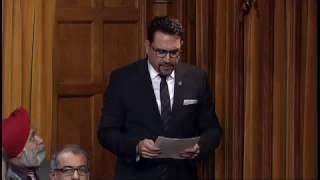 I stood in the House on Nov. 2nd to ask Minister Scott Brison about our government’s plan to tackle climate change. Here is a link to the announcement: http://news.gc.ca/web/article-en.do?nid=1146639 The full text of my question is here: "Mr. Speaker, Canadians understand that the economy and the environment go hand in hand, and that any credible plan to reduce our production of greenhouse gases must include carbon pricing. In the federal sustainability strategy, the government announced its intention to create a low-carbon government. Can the minister update the House as to the government's plan to do its part in tackling climate change?" 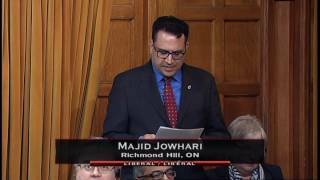 It gave me great pride to stand up in the House this afternoon to recognize the amazing women of #RichmondHill. Full text of my speech: "Mr. Speaker, I am pleased to speak on the occasion of Persons Day, a day that recognizes the historic decision to include women in the definition of ‘persons’ under the law, which was handed down on October 18th, 1929. It is hard to believe today that a law needed to be passed for us to legally recognize the remarkable contributions of women to our democracy and to our society. When I think of the incredibly talented women in my riding, and their achievements, I am nothing short of inspired. 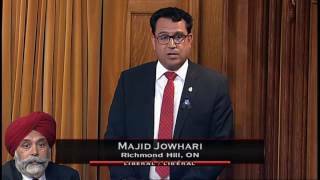 In particular Mr. Speaker, I would like to take this opportunity to commend Janine Purves, Anne Marie Dean, Marj Andre, Kathleen Mochnacki, Sherry Bennett, Heather Skoll, Fatima Sajan, Mahnaz Shahbazi and Amy Tam for their hard work and dedication toward the betterment of our community in Richmond Hill. Their contributions have impacted Richmond Hill in key areas including the eradication of poverty, environmental action and community cohesion. Mr. Speaker ‘Because of Her’ Richmond Hill is a better place to live." Added October 21, 2016 from MP Jowhari Office. It gave me great pride to stand up in the House this afternoon to recognize the amazing women of #RichmondHill. 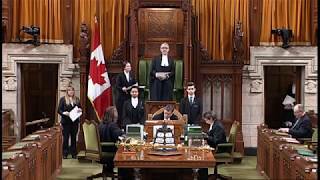 You can view the video here and see the full text of my speech below: "Mr. Speaker, I am pleased to speak on the occasion of Persons Day, a day that recognizes the historic decision to include women in the definition of ‘persons’ under the law, which was handed down on October 18th, 1929. It is hard to believe today that a law needed to be passed for us to legally recognize the remarkable contributions of women to our democracy and to our society. When I think of the incredibly talented women in my riding, and their achievements, I am nothing short of inspired. 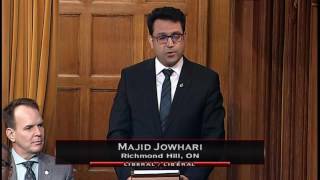 In particular Mr. Speaker, I would like to take this opportunity to commend Janine Purves, Anne Marie Dean, Marj Andre, Kathleen Mochnacki, Sherry Bennett, Heather Skoll, Fatima Sajan, Mahnaz Shahbazi and Amy Tam for their hard work and dedication toward the betterment of our community in Richmond Hill. Their contributions have impacted Richmond Hill in key areas including the eradication of poverty, environmental action and community cohesion. Mr. Speaker ‘Because of Her’ Richmond Hill is a better place to live." 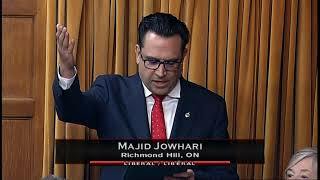 Mr. Majid Jowhari (Richmond Hill, Lib. ): Mr. Speaker, September 17 was World Marrow Donor Day. For that occasion, I rise to share a story of my summer. It is a story of commitment, community engagement, patience, and kindness. It is of the efforts of Ms. Niki Rad and Ms. Babain of Richmond Hill to mobilize over 35 young volunteers in organizing a stem cell registration event in Richmond Hill. In working closely with Canadian Blood Services territory managers, Ms. Sharr Cairns and Ms. Beth Frise, they provided for more than 700 patients in Canada waiting for a stem cell match. This summer, Richmond Hill made me proud to see a community united, with love in their hearts, swabbing their cheeks hoping to be the one match that would cure a Richmond Hill girl of cancer, but also to help others in need. I encourage all to participate in this initiative. 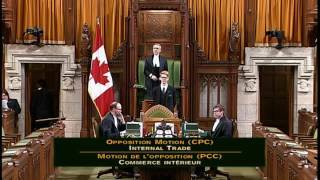 I delivered speech on our governments efforts in improving internal trade in Canada. 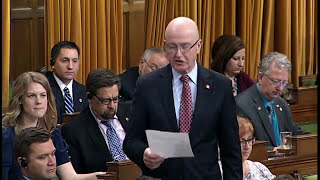 Mr. David Sweet (Flamborough—Glanbrook, CPC): Mr. Speaker, for decades the Baha'i community has been the most persecuted peoples in Iran, but in the past few weeks the ruling Mullahs have orchestrated an increasingly hostile and systematic attack on the Baha'i Iranians. The situation is surely grim for the Baha'i. The eyes of the world are on Iran, and much of the international community is speaking out and putting the appropriate pressure on Iran. Why have the Liberals been so silent in denouncing the latest wave of hatred? Why are they not speaking out and pressuring the Iranian regime to stop the attack on the Baha'i people? Ms. Pam Goldsmith-Jones (Parliamentary Secretary to the Minister of Foreign Affairs, Lib. ): Mr. Speaker, we have repeated our commitment to re-engage with Iran in a step-by-step and cautious manner. Canada's severing of ties with Iran had no positive consequences for anyone, not for Canadians, not for the people of Iran, not for our allies, like Israel, and not for global security. It was fortunate, for instance, at the end of the 1970s that we had a Canadian embassy in Tehran, when it was time to help the U.S. hostages. Our allies are also re-engaging with Iran, most recently a European Union delegation. The Conservatives seem to want Canada to stand alone, which helps no one. 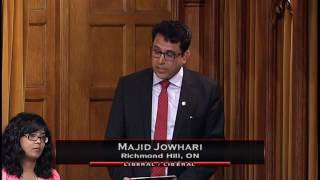 Majid Jowhari on re-establishing diplomatic & commercial relations bettween Canada and Iran. Madam Speaker, • At age of 18 I left Iran in pursuit of my education. • I could have not imagined then one day I would earn then honour and privilege of standing in this house. • I am PROUD to be an Iranian and I am PROUD to be a Canadian. • I bring a unique perspective to this house that few before me have. 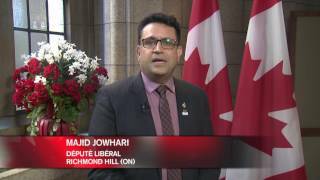 I understand the challenges and the aspirations of many Iranian Canadians. • A regime does NOT define its people, just as the divisive nature of our previous government, did not define the Canadians values. • It is disappointing to witness in this house some of my colleague’s attempt to conflate legitimate questions about the Iranian regime with the proud heritage of the Iranian people. • Canada is better off when engaging with the rest of the world. The world is better off when Canada is engaged. 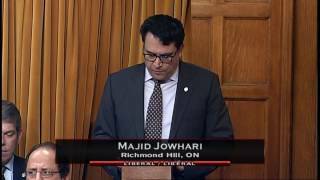 • I URGE the house to heed the calls of countless Iranian-Canadians advocating for re-establishing diplomatic and commercial relationships -between Canadians and the Iranian People. ** I am committed to do so. ** Thank you. 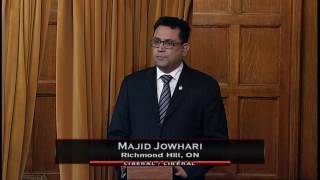 May 16, 2016 Mr. Majid Jowhari (Richmond Hill, Lib. ): Mr. Speaker, Canada has been an important part of groundbreaking scientific discoveries in many disciplines. One specific area where we have made a great contribution is in stem cell research. From Canadian discoveries regarding cancerous stem cell to nearly mapping stem cell genomics, we will continue to help further scientific advances for years to come. Can the Parliamentary Secretary for Science tell this House how our government will provide new funding to support stem cell research? Mr. Terry Beech (Parliamentary Secretary for Science, Lib. ): Mr. Speaker, we are committed to strengthening Canada's leadership in research excellence. Budget 2016 announced up to $12 million over two years to support the stem cell network's research, training and outreach activities. Stem cell research has evolved into one of the world's great promises, with significant implications for medical treatments, commercial products, and public policy. Our investment will support discoveries that will help to fuel Canada's economic growth while positioning us to succeed in the knowledge-based global economy. May 11, 2016 "Museums in Canada and around the world will celebrate International Museum Day on May 18. It also happens to be the day that I met my wife 27 years ago. This year's theme is “Museums and Cultural Landscapes”. In a country like ours, where our rich natural heritage is such an important part of our culture and historic events that have shaped us, this is particularly appropriate. In Richmond Hill, the Museum of the Streets is a new kind of museum experience, taking away the four walls of the traditional museum and opening up the heritage of the town for all to see. This always open and free journey of discovery that one is the tour guide of through the streets, is showcasing the obvious, and sometimes the not-so-obvious, all signposts to our fascinating past. I encourage all Canadians to visit the Museum of the Streets in Richmond Hill and all other wonderful institutions, and take advantage of all that they can offer."